It's very difficult for community-driven and privately owned conservation projects to get funding for marketing tools such as brochures, websites, and ad campaigns or with business planning for their tourism efforts. ConserVentures seeks out geographically important and underfunded efforts to provide these much-needed resources, filling the gaps quickly and efficiently, free of charge. Explorers aren't tourists—we enjoy getting involved with projects and people we meet on our travels. ConserVentures organizes or facilitates opportunities to donate skills to assist communities, land owners, and research projects. Skills that can help a project include anything from marketing, business development, financial planning and management to photography and writing, to construction and field work assistance. For examples of skills donations trips or projects we've facilitated, click here. If you would like to donate time, please see our Contribute your skills page. Researcher Paul Schuette and Resource Centre staff coordinator Albert Kuseyo training resource assessors in GPS.The South Rift valley of Kenya covers an area of approximately 850,000 hectares, spanning from the Maasai Mara Reserve to Amboseli National Park. The area is home to the Maasai, who move across the region in search of pasture for their livestock. Ecologically, the area is one of the most diverse in Africa, home to some 65% of the region’s famous wildlife. This privately owned 10,000-acre ranch is only 2 hours from the U.S. border, and is an important linkage connecting the vast wilderness of the Sierra Madre Occidental to the southern wildlands of the United States. The area is home to jaguars, ocelots, cougars, and bobcats—“cuatro gatos”—in all, over 30 threatened and endangered species. Supporting Carlos Robles and his family through eco-tourism is key to encouraging other ranchers to protect the cats on their lands, and implement similar conservation efforts. Two ConserVentures board members are working with a community in Micronesia to re-invigorate traditional building and canoe-making skills. With a long history in the community (dating to the 1960s as Peace Corps volunteer), Steve Hayden and Diane Boyer traveled to a small, remote Pacific island to work with the natives who wanted to renew constructing aend using waharak (traditional ocean-going outrigger sailing canoes), but lacked funds for and access to tools and sail cloth. The pair delivered adze blades and other hand tools, and 90 yards of sailcloth. 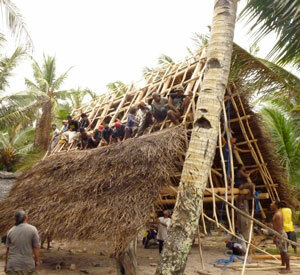 The team documented the construction of several canoes and the building of a large uut (thatch-roofed boat house). More documentation coming soon, including video, which is being shared with the community this year.